Categories | Books | Liturgy | What am I doing for Advent this Year? What Am I Doing for Advent This Year? will help you enter into the wisdom of Advent- -the season of joyful expectation and spiritual preparation for the coming of Christ. Though brief and direct, this little booklet is a serious "workbook" that presents Advent as an opportunity for spiritual focus and renewal at a usually hectic and exhausting time of year. It invites you to take stock of your customary ways of observing the four weeks and of your spiritual state at this moment. 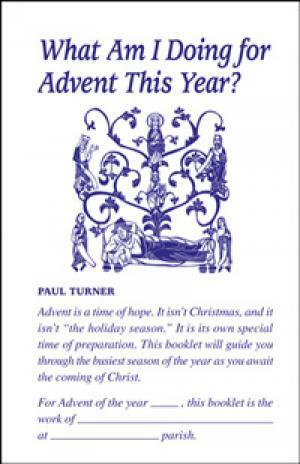 Paul Turner offers engaging descriptions of Catholic Advent practices and explores three memorable figures of the Advent scriptures--Isaiah, John the Baptist, and the Virgin Mary. He then guides you through a reflection process that will lead you to fresh insights and resolutions for this Advent season. Paul Turner is a pastor of St. Munchin parish in Cameron, Missouri and its mission, St. Aloysius in Maysville. A priest of the diocese of Kansas City-St. Joseph, he holds a doctorate in sacred theology from Sant-Anselmo in Rome. He has written many pastoral resources, including What Am I Doing for Lent This Year? and What Am I Doing for Triduum This Year? Reviews for What am I doing for Advent this Year?